Consider the following tips for better email cover letters. Take a moment to think about the resumes you’ve submitted by email. How many resulted in interviews? How many did not? If you’re like most hospitality job seekers, the answer to the second question is probably more than a few—and your email cover letter may be to blame. If you’re not giving this digital introduction the consideration it deserves, you may be encouraging hotel and restaurant hiring managers to delete your missive. Fortunately, it’s never too late to improve your approach. Consider the following tips as your ultimate guide to better email cover letters. Take them to heart, use them wisely—more interviews will be your reward. Consider the subject line carefully. Never send your cover letter as an attachment. Hotel and restaurant hiring managers are busy. They don’t have time to download and open multiple documents. If you attach your cover letter to the email, they’re likely to ignore it. Instead, make it easy for them to read your carefully crafted words. Copy and paste the content of your cover letter into the body of your email. Don’t forget to add a salutation and a confident closing (such as “I look forward to speaking to you soon”). Few hiring managers are going to scroll through pages upon pages of irrelevant details. For best results, create an email cover letter of no more than three to four paragraphs in length. The first paragraph is perhaps the most important. If you’ve met the hiring manager before, or are applying for a position as a result of an employee referral, mention that here. Then go on to explain your interest in the opportunity and your unique qualifications. Don’t skip the cover letter altogether. Whether you’re a general manager, a front desk manager, or an executive chef, you’re not doing yourself any favors if you attach your resume to an email that reads, “Resume attached,” or, even worse, one containing no information at all. This is the first impression the hiring manager will form of you—don’t make it a blank one. At minimum, take the time to introduce yourself—and try to make it memorable. Don’t use a cover letter template. Email software spellcheck tools are notorious for missing errors. While they may help you identify the most glaring typographical blunders, they’re of little use when it comes to grammar, punctuation, and formatting. Before you send your email cover letter to any hiring manager, read your subject line and review the body of the email two or even three times. Then, send it to a trusted pair of eyes for a final review. As the old saying goes, you never get a second chance to make a first impression. Make sure your email cover letter leaves the best one possible. 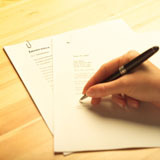 • Does Your Cover Letter Make These 5 Critical Mistakes?